"S" Curve Vertical blinds offer a curved vane for tighter closure and added privacy. Instead of traditional flat or "C" shape curved vertical vane, the s curve has a contour or curved vane in the shape of an "S". Self aligning carrier to keep the vanes aligned. Durable mechanisms for tighter closure and longevity. 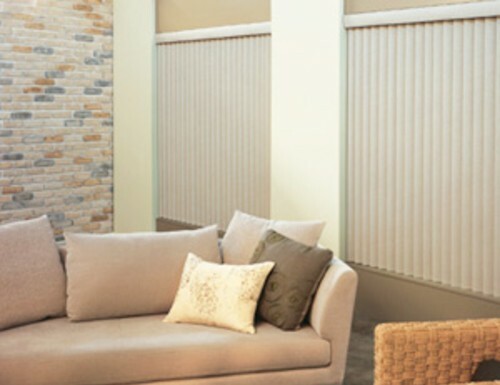 Buy vertical blinds online today at Blinds Chalet! For the s-curve vertical blinds, can these be either left or right side draw for window and patio door lengths? Yes, when you place your order, you have the option to specify the draw position. Any of our PVC vertical blinds can be cleaned with a damp cloth. If you have a stubborn stain, you can try a little cleaning detergent on a cloth first, and wipe them clean. On the s curve vertical blinds, are the reverse side of the ivory white or ivory? The back of the S curve verticals are white. Is WHITE ICE no longer a color option for the S Curved Vertical Blinds? Im sorry its not, that color was discontinued earlier this week. These are absolutely beautiful ! Not many vendors carry them we could find online, and we had a in-house estimate form another company and consultation, not only did we save a ton of money we did it ourselves and it was easy...just take your time and accurate measurements. The consultant was really pressing on how you need a pro to install ! well I guess my wife and I are now pros ! I will highly recommend Blind Chalet to others. They have only been up about 2 weeks so far so good no mechanical issues. Customer service is great too . I had a big order and they were very helpful. Beautiful & well made. Strong. Easy to install. Excellent quality and priced right. Excellent quality and priced right. Excellent sunlight blocking.